I'll bet your muscle growth is much slower than it should be. Why? Because you've been following training programs designed by guys that have a much easier time building muscle than you do. You can change your sets, reps and exercises all you want but it's probably not going to help much. In fact, that's probably what you've been doing for the last few months, or even years. So what's the solution? You must do two things. First, stimulate the stubborn muscle group the way it's designed to work. Second, trigger muscle growth more frequently without adding more time to your workouts or training schedule. Look, you don't need to make more trips to the gym or buy an expensive piece of esoteric equipment. The tricks for triggering growth don't depend on either of those factors. But simply working a muscle more frequently isn't going to make it bigger. If that were true, all marathon runners would have massive glutes and calves. You must learn exactly how to stimulate the largest muscle fibers with a specific set of guidelines. As a professional trainer, it's my job to get results faster than my clients expect. If I don't, they'll find another trainer. So I've been constantly researching and experimenting new approaches to speed up muscle growth. By necessity, I've had to figure out the unknown ways to stimulate muscle gains because the people that hire me have already tried all the typical stuff. I'm sure you have, too. And I'm not surprised that none of it worked. It didn't work because those training programs weren't designed for true hardgainers. So how should you train to build muscle twice as fast? 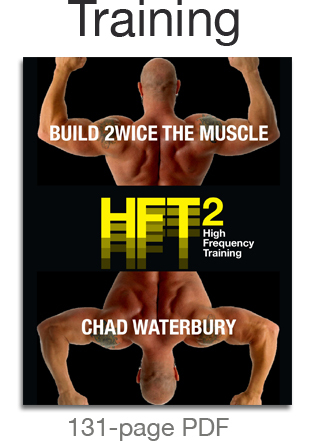 I started experimenting with more frequent training with my clients in 2001, and in 2012 I released the original High Frequency Training (HFT) program. Thanks to the massive amount of feedback I had received from people who tried that program, along with my endless experimentation with clients, I've come up with a new system that blows away the original. What's different about HFT2 compared to the original? Everything - and that's no exaggeration. Over the last two years I was relentless to find at least one unique trick to build muscle faster than I expected. I found three of them. But each one needs to be modified depending on the muscle you're trying to build. And with full-body training, the variables have to shift in a specifc way. All of those elements - and a whole lot more - are included in the all-new, 131-page HFT2 training manual. No stone is left unturned as I cover everything from the latest research to real-world data for HFT2. You'll learn how to build muscle across your entire body or just target it where you need the most growth. All the programs are laid out in a simple format with links to videos for each exercise so you're sure to do each move with perfect form. Each of the workouts consist of sets and exercises that you've probably never seen before. That's why the all-new instructional videos are included to guide you. My clients and I are right there with you to ensure that you're getting the most growth-inducing work out of every exercise. The videos are in high-definition format that can be quickly played on any mobile device. And they're compatible with a Mac and PC. I took great lengths to make the instructional videos in this program top-notch. Unlike the original HFT, the new HFT2 contains training logs for every program. Whether you're targeting a specific muscle such as the biceps or glutes, or following one of the 12-week full-body programs, you'll have printable workout logs to keep track of all your progress. The combination of the training system, instructional videos and workout logs result in my most effective muscle-building program to date. I can assure you that the workouts and strategies are unlike anything you've seen before. Don't miss this opportunity to finally experience the muscle growth you've been waiting for. It's time to leave the normal way behind and shock your body to a higher level of development than you ever imagined! BONUS: original HFT included with download! I'm confident this new system will be lean muscle faster than ever before. It's time to get the body you've always wanted. Q: Can females do this program? A: The physiological laws of muscle growth don't change with gender. Therefore, this system is ideal for males and females. The difference, however, is the way females will probably use this system. For example, many females will want to add shape to their glutes, not their biceps. So females can pick and choose the right plans for them. A: No. All of the workouts require nothing more than your body weight and basic weights such as kettlebells, dumbells or a barbell. Rings are also part of this program, but they're not required since alternative exercises are outlined. Q: Will this program take a lot of time each week? A: Absolutely not. There are four full-body workouts per week that each take around 45 minutes. And the targeted HFT2 plans for each major muscle group only take minutes a day and require little to no equipment. Q: Will these books get shipped to me? A: No, HFT2 is a downloadable e-book. No physical products will be shipped. The Adobe Acrobat PDF files are instantly downloaded to your computer and there are video links to the exercises in each workout. So you can take the HFT2 program with you on any mobile device. Q: Can I view the HFT2 system and videos on an iPad? A: Yes, you'll just need the free Adobe Reader app. Just open the HFT2 zip folder on your computer and then send the PDFs to your iPad. It's as simple as that! Clickbank is the retailer of this product. CLICKBANK® is a registered trademark of Click Sales, Inc., a Delaware corporation located at 917 S. Lusk Street, Suite 200, Boise Idaho, 83706, USA and used by permission. Clickbank's role as a retailer does not constitute an endorsement, approval or review of this product or any claim, statement or opinion used in promotion of this product.